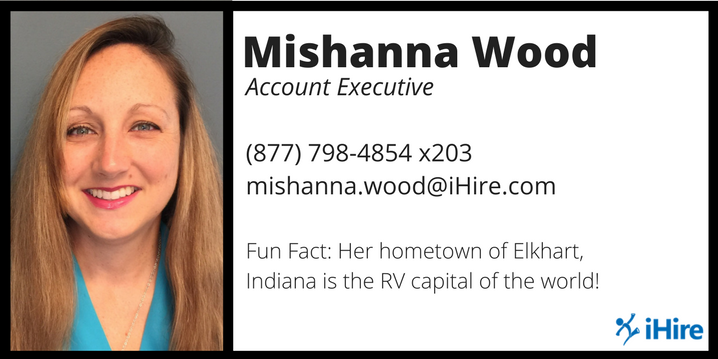 Meet your Account Manager, Mishanna Wood! Mishanna leverages her extensive experience in advertising to help companies of all sizes secure the right talent quickly and cost effectively. She works with organizations in a wide variety of sectors and is dedicated to the success of each and every client. Her solutions-oriented attitude and background developing customized media strategies make her a valued resource for employers seeking to incorporate branding into their recruiting efforts. MW: Employers often seek out iHire when they are frustrated with trying to sort through unqualified applicants. They’re stressed because they can’t fill jobs fast enough or they need to expand their candidate pool. I believe the most rewarding part about partnering with our clients is creating effective solutions to address these challenges, then hearing about our clients’ success stories. What makes iHire different from other job boards/career platforms? MW: One of my favorite things about iHire is the candidate-centric experience – everything is tailored to their industry. The search experience on other job boards can be annoying because jobs unrelated to their specific industry will appear in results. At iHire, job seekers don’t have to filter through jobs unrelated to their skill set. And when it’s easy for candidates to find the right jobs, employers win too! MW: There are so many successes it’s hard to pick just one! The best feeling is when a client has come to us with a hiring problem that we’re able to solve. I enjoy hearing the joy in our clients’ voices when they’ve found the right candidate(s) through iHire. MW: Right now the U.S. is at full employment which has created a robust candidate market. For employers, they really have to get creative and compete against each other for talent. It’s exciting because iHire has great ways to expand an employer’s reach and help businesses brand themselves toward a unique pool of job seekers. MW: As a kid, I read all the Black Stallion series books and Saddle Club books so of course I wanted to be a jockey. What’s your favorite movie/book and why? MW: I like many movies and books and don’t feel that I have a favorite! However, I really like to read and watch the news so I stay updated on current events. MW: Be persistent and maintain a positive attitude.